This volume recognises how many researchers across the social sciences, and in comparative and international education in particular, see themselves as insiders or outsiders or, more pertinently, shifting combinations of both, in the research process. The book revisits and problematises these concepts in an era where the global mobility of researchers and ideas has increased dramatically, and when advances in comparative, qualitative research methodologies seek to be more inclusive, collaborative, participatory, reflexive and nuanced. Collectively, the chapters argue that, in the context of such change, it has become more difficult to categorise and label groups and individuals as being ‘inside’ or ‘outside’ systems, professional communities, or research environments. In doing so, it is recognised that individual and group identities can be multiple, flexible and changing such that the boundary between the inside and the outside is permeable, less stable and less easy to draw. The book draws upon an exciting collection of original research carried out in a diversity of educational systems from British, European, Latin American, Indian Ocean, South Asian, African and Chinese contexts and cultures. This develops a deep and innovative reconsideration of key issues that must be faced by all researchers involved in the planning and conduct of in-depth field research. This is a challenging and stimulating methodological contribution, designed to advance critical and reflective thinking while providing practical and accessible guidance, insights and support for new and experienced researchers within and beyond the field of comparative and international education. In this chapter we present some initial ideas on how the theoretical concepts of the ‘insider’ and the ‘outsider’ might be re-examined in an era where advances in comparative, qualitative research methodologies seek to be more inclusive, collaborative, participatory, reflexive and nuanced. Earlier essentialist definitions of the outsider as detached and objective, and the insider as culturally embedded and subjective, are re-examined and set within an international research and teaching context which recognises the increased migration of people, ideas and educational policies. We argue that, in the context of such change, it has become more difficult to categorise and label groups and individuals as being ‘inside’ or ‘outside’ systems, professional communities, or research environments. We recognise that individual and group identities can be multiple, flexible and changing such that the boundary between the inside and the outside is permeable, less stable and less easy to draw. Exploring the Concept of Insider' Outsider in Comparative and International Research: essentialising culture or culturally essential? From the title of this book we gain a sense of the distance travelled since this idea was first introduced to the field of comparative and international education. The comparative method is implicit in the terms ‘outsider/insider’, and in the early days of comparative education there would have been no need to ask ‘inside and outside of what?’ Sadler’s seminal speech in 1900 provides the answer: ‘The practical value of studying ... the working of foreign systems of education is it will result in our being better fitted to study and to understand our own’ (Sadler, 1900). The binaries of us/ them, English and ‘foreign’ systems of education provided the basis for comparison, and the purpose was to learn and develop through this analytical process. This chapter seeks to explore the power relations that help to construct ‘insiders’ and ‘outsiders’ within research groups. It identifies three idealised collectives – emergent, established and exclusive – and discusses how each of these constructs the insider and outsider and the implications of this for comparative researchers. The aims of this chapter are twofold. In the first place, it uses a discursive perspective to revisit the insider/outsider binary, considers some its conceptual limits, and re-examines the features that are typically captured in the use of insider/outsider constructs. In the second place, it seeks to support the opening of discursive space for researchers to actively participate in the re-positioning of researcher subjectivities; and this is treated as an intrinsic aspect of the development of the international and comparative education research field. Both of these aims are grounded in the observation that education researchers are actors in the education systems which are the object or site of their research activity, and so are not immune from the processes and practices through which researcher roles, identities and subjectivities are being reformulated and reformed. The relative positioning of the researcher within the research activity, and how it may be changing due to the dynamic context in which contemporary education research takes place, is a current issue of concern for international and comparative education research (McNess et al, 2013). 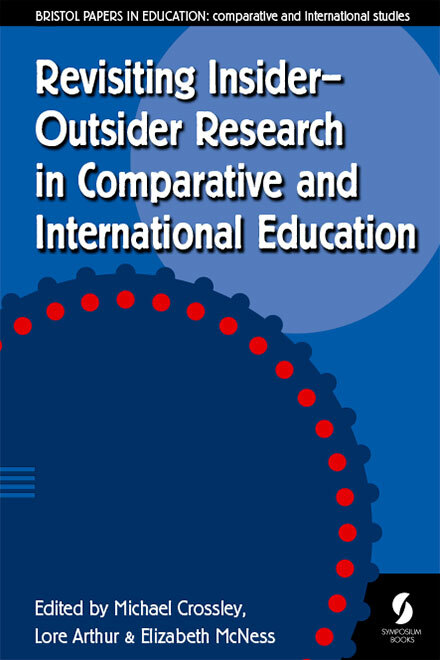 McNess et al also emphasise that the insider/outsider construct, as applied to ‘researchers and the researched’ in international and comparative education, requires a more nuanced understanding of the relationship between these two groupings and how individuals might situate themselves through insider conceptions. A critical approach to discourse analysis as presented in this chapter provides an analytical method for reconceptualising these relationships. This chapter considers five research projects in which the author was a researcher who explored the embedded cultural values of several European countries. The studies are not representative of research in international and comparative education. The chapter is ‘reflective’, as the concept of the ‘third space’ is applied after the completion of the original research projects. The boundaries and meeting points between national cultures of education where national values met were explored by researchers with varied positioning, in different locations, methodologies, areas and stages of research. The parties involved were multinational researchers and, in limited cases, the participants themselves. During every research journey the production of ethical and credible research depends on researchers reflecting critically and being transparent about the methodological issues and challenges they face, including how their background and position as insider or outsider might shape the generation and interpretation of data. In this chapter we consider influences that challenge traditional methodological dichotomies of insider/outsider and self/other (defined by characteristics such as gender, ethnicity, language and professional status) as we recognise the limitations of these dichotomies in considering both our own role as researchers and that of our participants. Insider and outsider positionings have long been theorised in the social sciences, with their definitions differing over time and across disciplines. Steeped in the history of both anthropology and sociology, these perspectives are integral to the debates regarding what valid research is deemed to be. In the field of international and comparative education, a number of authors have recently sought to reconsider insiderness and outsiderness and argued against their fixed dichotomous entities (Arthur, 2010; Katyal & King, 2011; McNess et al, 2013). Arthur (2010) argues that a researcher’s identity can shift dependent on the situation, the status of a researcher as an insider or outsider responding to the social, political and cultural values of a given context or moment. While this recent attention has highlighted theoretical developments in thinking about insider–outsider perspectives, less focus has been paid to the methodological processes that contribute to such shifting positionings while conducting cross-cultural research. This chapter seeks to address this by reflecting on the researcher experience during one such qualitative study. In this chapter I reflect upon my doctoral research in which I explored the perceptions of ‘feeling valued’ held by primary school teachers working for an educational organisation in rural, mountainous northern Pakistan. I did this as a bicultural researcher who possessed multiplicities of ‘insidernesses’ and ‘outsidernesses’ related to the research context and my previous professional experience within the organisation. In considering the theory surrounding the concepts of ‘insiderness’ and ‘outsiderness’, I acknowledge that rather than using a dichotomy of being either an ‘insider’ or an ‘outsider’ we need to have a more detailed understanding of how various researcher positionalities interact, as well as of the possible continuum along which they might move and how they influence the research process. I draw on the deemed advantages and disadvantages of being an insider and an outsider by virtue of the numerous interrelating and interacting ‘status sets’ that I held. This chapter examines insider–outsider experience during research on literacy among Gypsies and Travellers. It outlines the theoretical concepts underlying the approach and the ethnographic and constructivist methodologies adopted. It reflects on the process of gaining access to a marginalised community. It describes Gypsy and Traveller multiple identities, their culture and history and their suspicion of researchers. It refers to the settled or mainstream community’s prejudice, lack of knowledge of Gypsies and Travellers and the ongoing tension between the two communities. This chapter discusses the nature of international students’ transnational experiences and their impact on the (re)construction of their identities within and beyond national and cultural boundaries. The discussion is located in the theoretical framework of transnationalism and explores in detail the ways in which the students negotiate meaning as an insider and outsider, both in the host country of their study and also on their return to work in their home countries. Investigating Processes Underlying Identity Formation of Second Language Master’s Students in UK Higher Education: insiders or outsiders? In this chapter I deploy the outsider/insider concept as a heuristic for investigating the processes underlying the identity formation of two second language master’s (MA) students on different courses in anglophone academia. To this end, I adopt Goffman’s (1959) dramaturgical ‘frontstage, backstage’ metaphor as an analytical lens. Viewing each course as a ‘community of practice’ (Lave & Wenger, 1991), in which practices, underpinned by discourses, reflect values and interests of participants, I present data extracted from a 13-month ethnographic study which focused on the experience of second language students in their social learning spaces both ‘frontstage’ and ‘backstage’. In line with Pavlenko and Blackledge’s (2004) poststructuralist view of identities, I apply a socio-historical perspective to examine how the participants’ experiences contribute to the formation of both insider and outsider identities during the course of their master’s programmes. This chapter reflects upon how the methodological positioning of one researcher shifted during a study about head teacher leadership challenges in international schools in Hong Kong. Although the initial research position was one of the neutral ‘outsider’, when data were collected and organised, the researcher moved alongside the participants to facilitate the co-construction of professional knowledge. The conclusions reflected the insider view of the lead researcher, who is working in a similar head teacher leadership role and school context as the core research participants. However, collaboration with the second author generated engagement with the broader international and methodological literature and, in the light of this, we argue that the fluidity offered by what became an ‘alongsider’ approach better reflected the complexity of the research process and supported the emergence of more nuanced and effectively contextualised conclusions about educational leadership in this sector of education in Hong Kong. In concluding, key findings from the Hong Kong study are identified along with a consideration of the potential of the alongsider approach for other practitioner researchers working in related fields. While we are aware of having acquired certain beliefs, knowledge and practices that we can consciously examine, much of what we think and do is less readily available for introspection. This chapter explores how an encounter with otherness can trigger an elicitation of taken-for-granted assumptions. My particular focus is on teachers’ knowledge and practices, and on fostering awareness of their professional knowledge and practices as sociocultural constructions. To do so, findings from comparative education research were harnessed to generate a cross-cultural experience of outsiderness in order to foster practitioners’ reflectivity. Joanna Al-Youssef is a tutor in English for Academic Purposes at the University of Nottingham. Joanna has an EdD (Doctor of Education) from the University of Bath and an MA in English Language Teaching from the University of Nottingham. Her teaching experience includes undergraduate, postgraduate and doctoral supervision levels. Her research interests are in the areas of the internationalisation of higher education, international policy, international students, and language and culture. Lore Arthur (PhD) is a research consultant at the Open University, supervising doctoral students. Previously she was senior lecturer at the OU’s Faculty of Education for many years. She has researched and published widely in areas of comparative education, lifelong learning, higher education and language learning. She was chair and vice chair of the British Association for International and Comparative Education (BAICE) from 2006 until 2010 and chair of the editorial board of Compare (2008–2010). She is co-director of the BAICE ‘Insider–Outsider Research’ Thematic Forum. Sughra Choudry Khan is an EdD graduate of the University of Bristol. She has formerly worked in the UK as a teacher and teacher educator and more recently in international educational development in Pakistan. Mindy Colin is an American educational researcher and consultant living in Mauritius. Prior to her PhD studies at the University of Bristol on education reforms in small island developing states, Mindy worked in the academic technology group at Loyola Marymount University in Los Angeles. She currently teaches at a Mauritian tertiary institution, consults with Mauritian private schools and tertiary organisations, and conducts research for NGOs and other agencies involved in local schooling initiatives. Her research interests are in educational technology in small states contexts. Michael Crossley is Professor of Comparative and International Education, director of the Centre for Comparative and International Research in Education at the Graduate School of Education, and director of the Education in Small States Research Group (www.smallstates.net), at the University of Bristol, UK. Professor Crossley is a former editor of the journal Comparative Education and former chair of the British Association for International and Comparative Education (BAICE). He is currently Adjunct Professor of Education at the University of the South Pacific, and is an elected fellow, FAcSS, of the British Academy of Social Sciences. He is co-director of the BAICE ‘Insider–Outsider Research’ Thematic Forum. Hania Salter-Dvorak, MA, Ed.D, is a lecturer in TESOL Education at Exeter University Graduate School of Education. Her experience in language education (teaching Italian, French and Arabic, and acting as subject leader for English for academic purposes in two UK universities) led to her interest in the development of academic literacy of second language graduate students, particularly in relation to identity formation in academic social spaces and socialisation into disciplinary genres. By examining the dynamic between culture, language, identity and power in learning processes, she is interested to identify ways in which universities can accommodate such students through appropriate course design and community building. Cecilia Garrido is a senior lecturer in modern languages at the Open University, where she has performed a variety of roles, including being Head of Spanish and Associate Dean (Learning and Teaching) in the Faculty of Education and Language Studies. She has extensive teaching experience in the UK and abroad. Her research interests and publications are mostly in the area of intercultural competence and its implications for language teaching and learning, teacher education and cultural integration. Qing Gu is Professor of Education at the University of Nottingham, School of Education. She is vice chair of the British Association of Comparative and International Education (BAICE) and a member of the editorial boards of Compare, the International Journal of Educational Development, the International Journal of Research and Method in Education, and the Journal of Educational Administration. She is the author of Teacher Development: knowledge and context (Continuum, 2007); editor of The Work and Lives of Teachers in China (Routledge, 2014); and co-author of Teachers Matter (Open University Press, 2007), The New Lives of Teachers (Routledge, 2010), Successful School Leadership: linking with learning and achievement (Open University Press, 2011) and Resilient Teachers, Resilient Schools (Routledge, 2014). Nilou M Hawthorne is an independent education researcher in sociolinguistics and education and works supporting non-formal and community education capacity-building in the rural parish of Hanover in western Jamaica. She has experience in higher education marketing, widening participation project development and academic librarianship in the UK, and community project development in Jamaica. Her research interests include the impact of discourses on higher education and the international education policy environment. Peter Kelly is Reader in Comparative Education at Plymouth University. His main interests are European education policy and comparative pedagogy. Since 2007 he has been working with colleagues at Aarhus University, Denmark and Freiburg Pedagogic University, Germany on a comparative pedagogy project titled Comparing and Analysing Teaching in Northern Europe (CATE). A second project is now in its third year, comparing the reading assessment of eleven-year-old children in primary schools in England with that of their peers in folkskoles in Denmark. Juliet McCaffery, MEd, PhD, is a research associate at Sussex University, UK. Juliet specialises in literacy, gender and equalities. She has worked in school and adult literacy in the USA, Brighton and London. She was the first gender and development officer at the British Council. She is now an independent consultant. She became interested in English Gypsies and Irish Travellers as an elected councillor and researched their attitudes towards education. Her research interests and publications concern literacy and marginalised communities. Elizabeth McNess, MEd, PhD, is a senior lecturer at the University of Bristol, Graduate School of Education and former director of the Document Summary Service, a policy briefing service for head teachers, teachers, educational administrators and those involved in policy research. She has a background in comparative research and has worked on several large ESRC-funded projects, publishing widely in the areas of education policy, teachers’ values and pupil experience of learning at home and in school in England, Wales, Denmark, France and Belgium. Elizabeth was previously secretary to the British Association for International and Comparative Education (BAICE) and an elected member of the executive committee. She is co-director of the BAICE ‘Insider–Outsider Research’ Thematic Forum. Lizzi O. Milligan is a lecturer in international education at the University of Bath. Her research interests focus on issues of social justice, equity and educational quality in low-income countries, particularly in eastern Africa. She is currently involved in a number of DfID-funded projects related to Rwandan primary education. She completed an ESRC-funded PhD at the University of Bristol. Until recently, she was the secretary of the British Association for International and Comparative Education (BAICE). Claire Planel, BSc, MA, PhD, has an academic background in anthropology and linguistics. She has been a research fellow in comparative education at the Graduate School of Education, University of Bristol, where her particular focus was in comparative pedagogy in England and France. That same interest in culture, language and learning has underpinned her work in primary schools, teaching English as an Additional Language. She supports primary schools, teachers and ethnic minority children in Gloucestershire, UK. Maroussia Raveaud was educated in the UK and in France, and graduated in English with teaching qualifications and a PhD in education. She held an ESRC postdoctoral fellowship at the University of Bristol in 2002–2003 and is currently a lecturer at the Université du Maine, France, and research associate at the University of Bristol, Graduate School of Education. Her research focuses on socialisation, citizenship, comparative education, teacher development, primary schools and qualitative methods. She is a member of the editorial board of the Revue Internationale d’Education de Sèvres. Anna Robinson-Pant is Professor of Education at the University of East Anglia. She was previously based for around ten years in South Asia (particularly Nepal) as a teacher trainer, educational planner and researcher. Her ethnographic research on women’s literacy and development in Nepal received the UNESCO International Award for Literacy Research. In UK higher education she has conducted research with international students and is particularly interested in internationalisation policy and practice. Nicola Savvides is a lecturer in higher education at King’s College London. Her research interests lie within the fields of intercultural, international and comparative education and qualitative research methodology. She has published widely on the intergovernmental European Schools and on the European dimension in education and has undertaken research on Erasmus students’ needs and experiences and students’ sense of citizenship and identity. She holds an ESRC-funded doctorate and two master’s degrees in education from the University of Oxford. Ed Wickins has been the principal of King George V School, an English Schools Foundation School in Hong Kong, since 2004. Prior to this, most of his teaching career had been in the UK, where he was the head teacher of two different comprehensive schools in Gloucestershire, UK. He also spent two years as a geography teacher in Malaysia. His interest in education research was stimulated by the University of Bristol EdD programme, and he completed his doctorate in 2014. He is particularly interested in the context of school leadership and he has worked with the Asia Pacific Centre for Leadership and Change in Hong Kong, the International Baccalaureate Organisation and various principal networks within Hong Kong to try to understand this better. His blog edwickins.me shares his perspectives.